An apparition moves from the ballroom to the hall, and can only be seen out of the corner of the eye. When you turn to look at it, it vanishes. I got married in 1999. 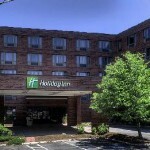 The reception was held at the Holiday Inn in Tewksbury. I don’t recall seeing an apparition but strange things happened all day in the Bride’s room. This room was located next to the room they took our pictures and was the place I was to spruce up and stuff. Things were moved from where I placed them. I just thought I was going crazy because of the day but the phrase most used by me and heard from anyone with me in that room that day was I swear I put this *** here but now it is over there. or where did it go. Until I saw this post it never occurred that it could have been a pranking ghost. It seems like a common thing ghosts do, trying to get attention I suppose.